Ask us how your teeth can be 10 shades whiter in one hour! Restore your smile to its natural luster. Rembrandt Lightening Gel can whiten teeth an average of 10 shades in one hour. It is safe and formulated to prevent sensitivity. Discoloration may be the result of genetics, medication, poor oral hygiene, aging, smoking, certain foods and beverages or a combination of these factors. Are you a good candidate for tooth whitening? 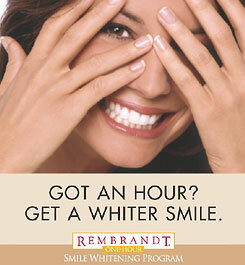 People with most types of discoloration can achieve lighter teeth through the Rembrandt One-Hour Whitening Program. The type of stain you have will affect how much whitening you will experience. Ask us how much whiter your teeth can be. What is Rembrandt Lightening Gel? Rembrandt Lightening Gel is a 35% hydrogen peroxide formula. When activated by the Rembrandt Sapphire or Rembrandt Virtuoso light, an average whitening of 10 shades is typically achieved. Is this whitening procedure safe? Absolutely! When used under the supervision of your dental professional, the procedure is safe and will not harm teeth or gums. The safety of the Rembrandt Program is supported by more than 20 research studies at leading dental universities. It is always performed by a dental professional, so you can be assured that the procedure is safe. They will use either the Rembrandt Virtuoso or Rembrandt Sapphire Light, in conjunction with the Rembrandt Lightening Gel to achieve an average whitening of 10 shades. Will I have to wear a mouth tray? Rembrandt Lightening Gel does not require the use of a mouth tray. This is a one-visit procedure that we perform. You will see results immediately rather than having to wear a mouth tray.